City Grid Quilt Pattern by Meghan of Then Came June. 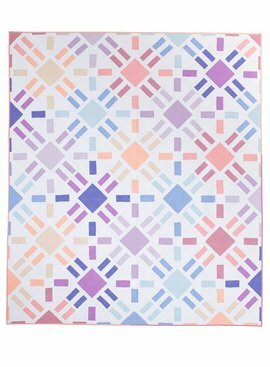 The City Grid Quilt Pattern is a modern minimalist take on a classic design, a window pane plaid. The quilt comes together at lightening speed due to simple and effective piecing and pressing. I added cornerstones to give the design a slightly different look than a solid grid. I love the play of negative space with bold pops of color. Definitely a weekend finish at its best!